Harcourt Children's Books, 9780152058388, 40pp. This fun-loving bunny knows that with a willing cohort, a creative spirit, and a little bit of ingenuity, anything is possible--even on the gloomiest of days. And after the pillow fights and cooking projects and hide-and-seek games and drawing on the bathroom mirrors and zooming and zipping and jumping and running inside, there’s more fun to be had outside. Because when the rain stops, the mud puddles beckon. Splat! The delightful bunny and mouse duo from Overboard! are back in a mischievous and messy romp that toddlers will adore. 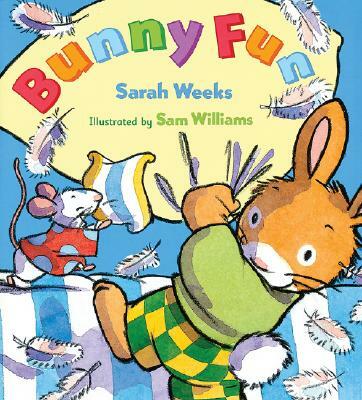 SARAH WEEKS is the award-winning author of numerous picture books and middle grade novels, including "Who's Under That Hat? "and "Ruff! Ruff! Where's Scruff?," both created with David A. Carter, and her own "So B. It." She lives in New York City. SAM WILLIAMS is the talented illustrator of many books for children, including "Little Red" by Sarah Ferguson, as well as "Pea Pod Babies," "Tumble Me Tumbily," and "Snuggle Me Snuggly!, "all by Karen Baicker. He lives in England.